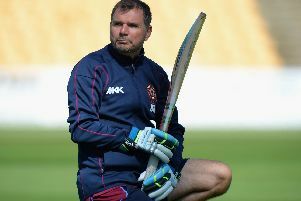 David Ripley has confirmed that Northants Steelbacks could look to bring Shahid Afridi back to the County Ground if they make the NatWest T20 Blast quarter-finals. Afridi played his final game for the county at Yorkshire Vikings last Sunday, signing off in style with three wickets in a superb eight-wicket win. He only joined for a six T20 games, helping Northants win two of those in the bid to progress from the North Group. Afridi, nicknamed Boom Boom, has now jetted off to play for St Kitts and Nevis in the Caribbean Premier League, having been in the top grade of the 11 payment brackets at the draft. That tournament begins on Saturday and ends on July 26, with the NatWest T20 Blast quarter-finals beginning on August 12. That means Afridi, who was acquired for $150,000 by St Kitts and Nevis, could return to Northants for a last-eight tie if they make it that far. And Ripley, whose side are now seventh, three points off the top of the North Group, said: “Shahid’s a top player and we’ll miss him. Steelbacks play their seventh game of their T20 campaign on Friday night when they host Lancashire Lightning at the County Ground (start 6.30pm).